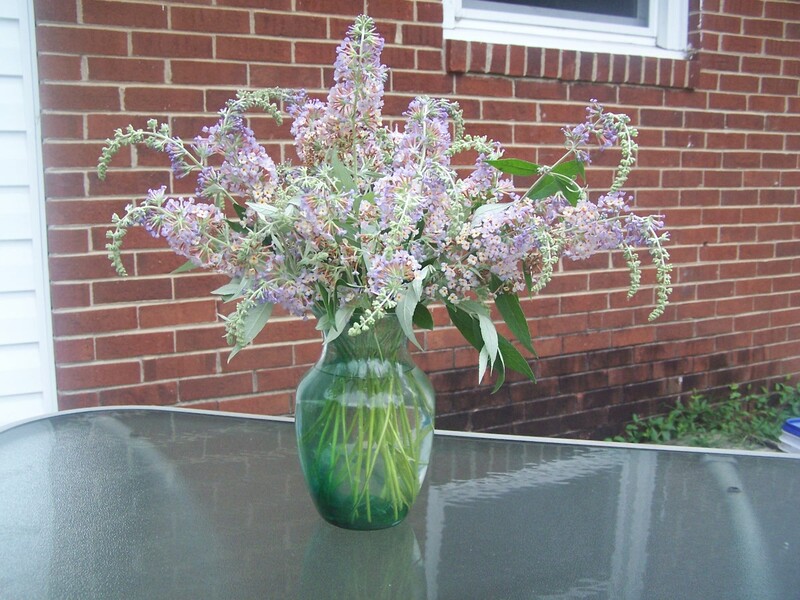 Butterfly Bush as Cut Flowers? They last for weeks and are lovely. I have several butterfly bushes, also knows as buddleia, in my garden beds. I love them because they attract butterflies and bees like no other plant in my garden. My main butterfly bush was put in a large island bed early this spring, when it was about 12″ tall. It is now at least 5 feet tall and 4 feet wide and just covered with purple flowers. I have also planted butterfly bushes along the fence line in my new perennial and vegetable garden. They hide the fence well and give a lovely splash of color along the fence line alternating with the big Japanese silver grass plants. The flowers from these bushes are a much deeper purple and they area a bit smaller than my lilac colored ones but still look great and last well as cut flowers. I place this little grouping in my easy to make Mason jar vase and they look super. I just need to get some purple satin ribbon when I go shopping next. Each day, I make my lunch and take it, along with my favorite gardening magazine, Garden Gate, out to a lawn chair. I have my lunch and then read for a while, as I wait for the butterflies and bees to swarm around my lovely Butterfly bush. One thing I did not realize is how lovely they are as cut flowers. Because they droop so much, I didn’t think they would do well indoors. How wrong I was! This vase of flowers was cut about three weeks ago, and they STILL look great indoors in the vase. I don’t think I have ever had cut flowers last that long for me! Since my plant is still flowering, I will have cut flowers right into the fall. 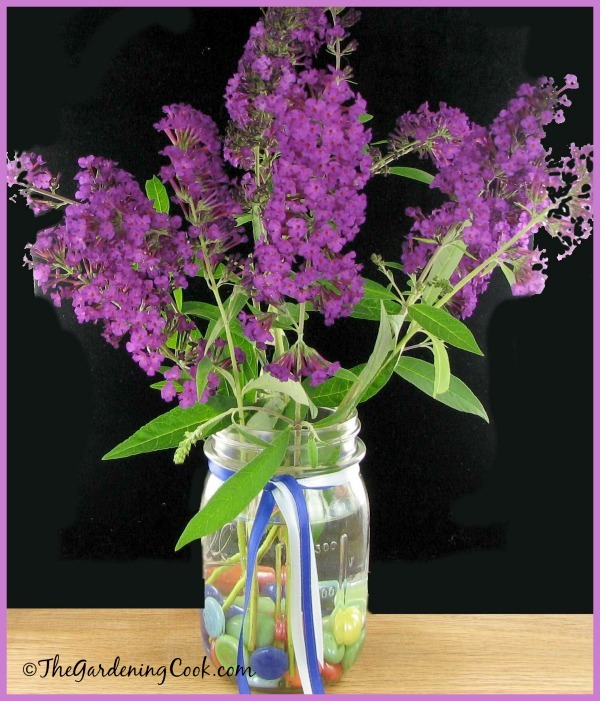 Butterfly bushes are very easy to grow. They produce flower in colors that include blue, pink, red, violet, yellow, and white, and the shrub grows 5 to 10 feet tall and wide, depending on the variety. To care for your butterfly bush, apply a thin layer of compost each spring, followed by a 2- to 4-inch layer of mulch to retain moisture and control weeds. 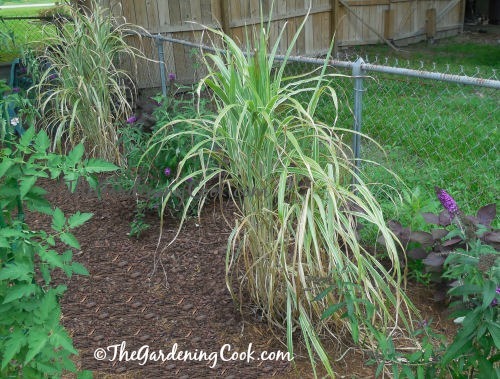 Be sure to water the plants during the summer if rainfall is less than 1 inch per week. Flowers are produced on new wood, so prune back old growth almost to the ground early each spring before any new growth emerges. And don’t forget to cut some flowers throughout the summer. You will be amazed to see how long they last indoors. I have a bush with blue flowers that is new for me. It is not flowering right now but I’ll add photos of it when it does. 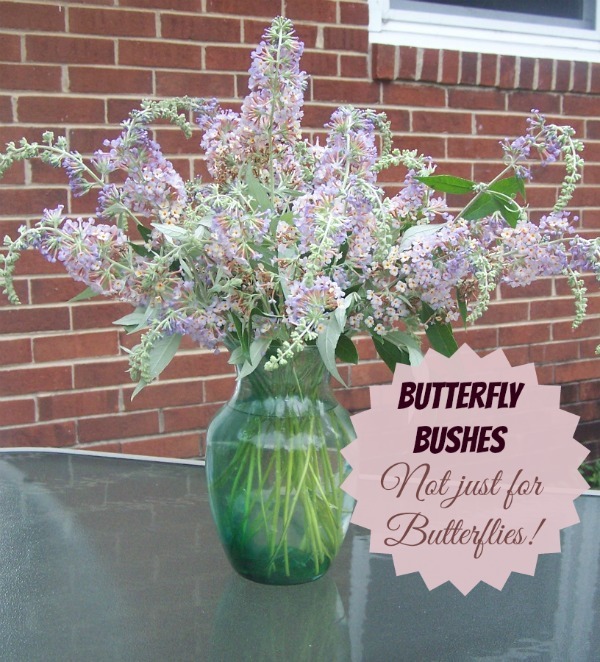 Does your butterfly bush attract a variety of butterflies? I’d love to hear about your experiences with this lovely perennial. I bought some butterfly bushes from a well known seed and plant company and they look nothing like yours. The flowers were tiny, and Instead of getting more they immediately produced seeds which were large with silky tails. I read that these bushes were invasive and dead headed them right away. Can you tell me what it is that they sent me? The plant got a pod on it with lots of large brown seeds with silk tails, and the entire plant became sticky with yellow pollen, I think it”s pollen, all over it. The wrong image came up first, and I hope it was deleted when I put the correct one up. Thank you. My Buddleia is 10 feet tall now, and have a lovely “honey velvet” fragrance! The Monarchs are happy visitors! My Black Night Butterfly Bush produces this 10″ long flowers every spring! This butterfly didn’t mind posing on my lavender blue Buddleia today! I planted a bi-color butterfly bush a few weeks ago. I love how it looks and smells. Bees are also enjoying it! Hi Alison. Very pretty color. I have one in the same family but a much deeper shade. It is lovely the way it attracts insects! Do you cut off the dried blooms once they die? Stumbling upon you, Carol has been one of those happy accidents! I too love the garden and do my share of experimental cooking. At 55 Yrs of age I was transplanted from my temperate homeland of South Australia to a freezing West Midland village. A shock to the system for sure! Just months after settling, it became essential that we move closer to London for specialist care as my husband’s renal cancer broke through his first remission. We thought it had left and locked the door behind it. But no. With vengeance it struck 15+ lymph nodes requiring potentially experimental medicine. I only tell you this because it explains why I’m still so ignorant about northern hemisphere plants. I’ve no understanding of most plants here. I’m now the alien and no longer the “go to” person for advice. Like everything in my life, it’s upside down and I’m the “to go” person annoyingly asking what seem to others like the obvious! I’m over-excited by the ridiculously stunning over-growth of plants here. From what looks like long deceased twigs in March to something towering over me by June! I speak of a plant I’ve fallen head over heels in love with. Buddleia! Magnificent pendulous deep purple blooms. I first came across the plant one hot August a few years ago. It grows right outside the entrance of my GP. I have a serious phobia around anything medical which is unfortunate for a person requiring life long medical intervention. And now with the additional exposure to it because of my husband’s unfortunate diagnosis. So….There was I, taking a therapeutic breather in the GP’s garden to calm my fears, when I happened upon something I could only describe as from a fairy tale. Hundreds of butterflies covered its entirety! It was heaving with activity. From large diva Monarchs to the modest tiny white ones. My senses were in a Divine overdrive. This plant even sings a chant of hums. And its scent a heady vanilla honey,,,So sweet! Then as I bent to get a closer look I lost my balance & toppled over! My fall was cushioned by soft velvet leaves. And any witnesses shuffled away quickly. To possibly save my pride? Now, please remember, this happened very publicly. To onlookers not knowing me, the scene was of an aging lady wearing Boho Hippy clothing (comfy and pretty! ), and a flouncy hat, who initially stood in awe,as if under the influence, gaping at this common bush. They must have thought I was an escapee patient from a local mental health facility! So there I was, sat inside and under this fairytale bush with an ecstatic, silly smile, looking up & around watching my butterfly fairies and discovering the cause for the humming. Bees. Hundreds of them! Even my bee sting allergy didn’t deter me. So, that is how I met my first Fairy Butterfly bush. The start of my obsession over Buddleia. Whilst sitting within it I could observe the patients coming and leaving. Dozens of seemingly “dead to the beauty” of the natural world kind of folk. Inward focussed. Hardened and sad with “No!” faces. Without spirit for life. And concentrating so hard against the harsh things of life that they miss ttnothe gentle! Not feeling safe enough to say “Yes!” to life’s beauty. No matter my circumstance, by observing the breathtaking beauty of the natural world, empowers me to stay open to the gentle goodness in my life of husband, dogs & creation. Hello Carol and friends! PLEASE FORGIVE ME IF ALL MY STORIES APPEAR HERE IN ERROR! I’m thrilled that I’ve found you. I love the garden, in its rustic form. Mine is a Hedgehog sanctuary and an adventure park in the eyes of my two dogs. I’m hoping that soon we’ll adopt three chickens to free range by day. Cooped up by night for their protection. Experimental cooking is one of my hobbies. I also knit blankets and I quilt huge throws. They take years to complete because of the daily chronic pain I’ve lived with much of my life. However, I really love my life. Having a loving husband (known since I was 15 & he 17 years) we are very close, a permanent home to decorate with imagination, my Toy Poodle Emma constantly with me and another….a younger busy, handsome mongrel is enough. To be able to house and protect hedgehogs gives even more purpose to life that I wouldn’t be able to do in my homeland of Australia. Although I’m perpetually homesick (and not able to return home due to my husband’s oncological needs and he has a brilliant pioneering team monitoring him closely here) I’m loving the quirkiness of the Brits and life here in general. And I hope to make friends now I’m truly “at home”.